When Jive Software announced a 30-day free trial promotion as part of its revamped cloud service, I expected ridicule from the founders of Yammer, who would inevitably try to paint it as a sham. Instead, the criticism came first from another social software maker, Moxie. Moxie Software, really? You won’t find pricing plainly listed on Moxie’s website, let alone a free trial or freemium offer. Instead, even though they sell cloud services, they offer a relatively old school “request a quote” contact form. Still, it was the Moxie people who reached out to me to ask, is 30 days really enough? Frankly, I’d been wondering that myself. If what you’re trying to show is the value of social collaboration across an enterprise, is 30 days long enough to make the connections and prove the value? The 30-day Try Jive offer was launched last week along with several other platform upgrade announcements from Jive Software. The cloud offering, Jive for Teams, aims to capture departments and project teams within large enterprises and open the door to bigger enterprise sales. 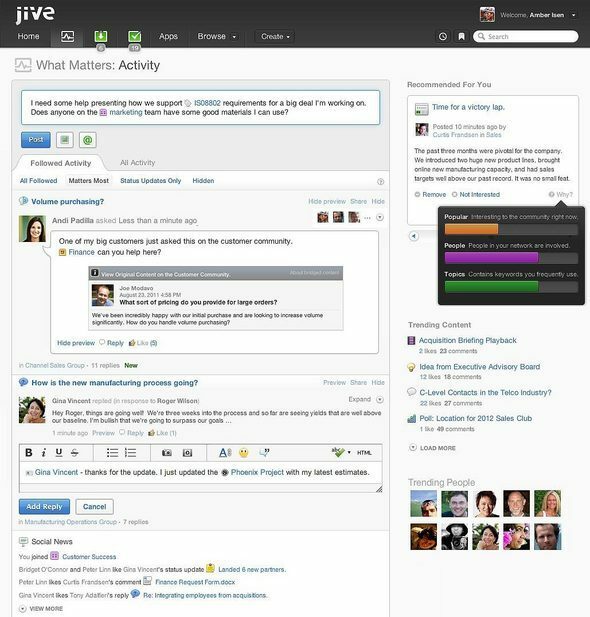 This is specifically for the internal social collaboration uses of the Jive platform, as opposed to its software for public social communities, such as technical support communities. Much like Yammer, Jive will now let you sign up for social collaboration in the cloud by supplying nothing more than an email address. Unlike Yammer, which will let you use a basic version of its product indefinitely, for free, Jive offers access to a full-featured version of its platform but for a limited time. Those customers who decide they want to continue pay a minimum of $12 per user per month, with a 25-user minimum. Shortly after Jive’s announcement, my friends at Moxie volunteered their opinion that Jive was going about this the wrong way. Moxie sells several different types of products, including chat, knowledge base, and other customer-facing social software, with its product for internal social collaboration a relatively recent addition. The complexity of the product line makes it difficult to publish a simple pricing schedule because different customers require a different assortment of features, said Tara Sporrer, the VP of marketing and sales operations for Moxie. “The volume of interest around social is very high right now, but our approach has been and education approach because we think that’s where the market is,” she said. Moxie’s pricing for internal collaboration is competitive at about $8 to $10 per user per month, Sporrer said. However, being too quick to quote a price for social software doesn’t make sense “when you haven’t even identified what the problem is” that the organization wants to solve, she said. To be fair, Jive isn’t actually saying that an enterprise sales cycle that has taken months in the past has now been boiled down to 30 days. “This is all about seeding the market,” CEO Tony Zingale said during an earnings call this week. Jive reported results that beat analyst expectations, although it is still losing money (or “investing in growth,” if you prefer). In an interview, Adam Mertz, a senior product marketing manager for Jive, said the company’s market research suggests a 30-day trial can be successful if it’s done right, and Jive is putting extra effort into making sure it’s done right. For example, Jive assigns a “success coach” to everyone who signs up, meaning each trial user is guaranteed a follow up by email and phone from someone who can answer questions and get their adventure in social collaboration started off right. My success coach called this morning, after I signed up yesterday, which is certainly a more high-touch experience than I’d expect for a freemium service. Of course, this person is also there to serve a sales function, but at least they are there to answer questions, too. – Amanda Mitchell of Allscripts on how to work better as a team (how to set up Jive groups). – Will Rose of T-Mobile on how Jive can help you and your team make faster decisions, with fewer meetings. – Trisha Liu of HP on using Jive for document collaboration. – Nick Howe of Hitachi Data Systems on using Jive to stay in touch and in sync. Overall, it’s a very warm welcome, on par with what you might expect from the best consumer products. The whole point is to make sure trial users make the most of the time they are given, Mertz said. “We actually had a team focused on the first 15 minutes experience, as well as the 30-day experience,” he said. “It looks like he’s become a pusher, too,” Sacks mused. This war of words continued even in the context of Jive’s earnings call. Although he did not mention Yammer by name, Zingale said one of the distinctions in Jive’s approach to the cloud is that “we do not hold our customer’s data hostage in the manner that certain freemium models employ.” That can be read as a reference to some of the controversial elements of Yammer’s business model, such as the absence of administration tools in the free edition of the product. Although Yammer doesn’t have quite the same “success coach” model that Jive is introducing, it already has “customer success managers” who serve a similar function, Sacks said. Because its freemium model brings in the mass market, not every new account gets the same personal attention. But Yammer employs algorithms “to figure out which networks are most interesting from an activity standpoint” and give those freemium users a nudge toward becoming premium customers. In a more consumerized market, Sacks figures he can approach this competiton like Coke versus Pepsi, where Yammer gets to play the part of the Pepsi Challenge. “Comparison shopping will be easier now than it was before,” Sacks said. Sacks added that Jive will probably not stick to the 30-day limit, given an opening with a large customer that wants a longer trial. I wondered about this, too. Jive’s Mertz told me they were pretty serious about sticking with the 30-day time period, although “we do have to assess everything on a case-by-case basis.” It’s also likely that organizations might sign up as paying customers on a departmental basis, even while continuing negotiations toward a bigger deal, he said. There are also signs that 30 days is more than enough. According to Jive, several of the customers who signed up for free have already turned into paying customers without waiting for the trial period to end.